Prior to the global economic rise of the United States in the 20th century, the United States Dollar was not quite the global asset it is today. In fact, when the US government first issued currency under the Continental Congress during the Revolutionary War, its low value gave rise to the saying “not worth a continental.” Right now, 2 oz Silver Continental Dollar Rounds are available to purchase online that revive this historic US currency design. Ships to you within a protective plastic package flip! From Intaglio Mint’s Colonial Tribute Series! Obverse includes the first-ever US currency design. Reverse depicts the unity of the colonies against British tyranny. Each of the 2 oz Silver Continental Dollar Rounds is available to you inside of protective plastic packaging. The Silver Continental Dollar Round is part of Intaglio Mint’s Colonial Tribute Series. Other options in the series include a silver round that mimics the designs of the Virginia Shilling, the only colonial-government coin struck under British colonial rule. Beginning in 1776, shortly after the signing of the Declaration of Independence, the Continental Congress gathered to decide upon the issuance of American currency for the colonies as a means of paying its bills during the war. In total, the Continental Congress issued just over $241 million in Continental Dollars, the equivalent (based upon inflation) of $6.26 billion today. The 2 oz Silver Continental Dollar Round design was in circulation on Continental currency from 1776 to 1782. This design reflected the popular mood of Americans at this point in history. 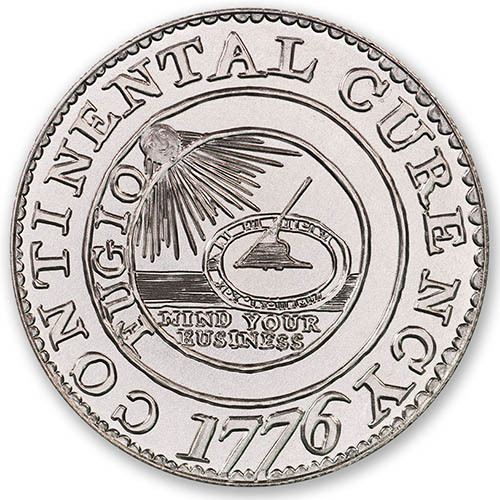 Fed up with British oversight, Continental dollars featured the phrase “Mind Your Business.” The Continental currency collapsed in 1782 and the US began striking different coins. On the obverse of the Silver Continental Dollar Round is that famous design from the Continentals, as the currency was referred to colloquially. The image includes a smiling sun as it shines down upon a sundial. “Mind Your Business” is engraved within, while “Fugio” is engraved on the rim near the sun. The reverse of the 2 oz Silver Continental Dollar Round includes the image of interlocking chains representing the unity of the original 13 colonies. Convinced of their sovereign right to strike their own coins, the colonies developed several designs for a silver dollar with Benjamin Franklin’s guidance. This reverse design includes 13 chains linked together with each colony’s name featured inside a ring. 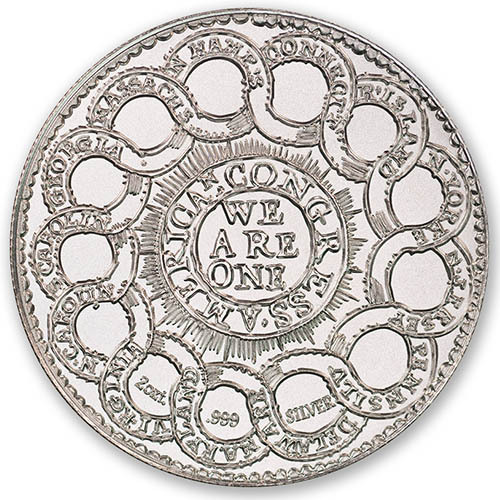 “We Are One” is engraved in the center, surrounded by “American Congress” around that feature. If you have any questions about these Intaglio Mint silver rounds, please feel free to contact us. Silver.com customer service is available at 888-989-7223, online using our live chat, and via our email address.